Cytogenetic heteromorphisms are described as variations at specific chromosomal regions with no impact on phenotype. The purpose of this study was to investigate the effects of these chromosomal polymorphisms involved in reproductive failure in the Romanian population. One thousand eight hundred and nine infertile patients, who were referred to Life Memorial Hospital, Bucharest, Romania, between January 2008 and April 2011, were investigated in this retrospective study. The frequency of chromosomal polymorphic variations was calculated for these patients. 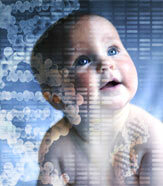 The control group is represented by 1116 fetuses investigated by amniocentesis between January 2009 and April 2011. In this study 122 (6.74%) infertile patients and 63 fetuses (5.65%) showed chromosomal polymorphic variations. The differences between the two groups was not statistically significant (p <0.242) but there was statistical significance for some specific chromosomal polymor- phisms [inv(9),1qh+, 9qh+, fra(17)]. Some chromosomal polymorphic variations appear to be associated with reproductive failure. The statistically significantly higher incidence of heterochromatic variations found in infertile individuals emphasizes the need to assess their role in infertility and subfertility.